Sometimes I make things really difficult on myself. I don't do it on purpose, mind you, but sometimes my ideas get a tad bit ambitious to execute. Take this salad for example. It's a salad. Salads are supposed to be easy. But for some reason, I decided to pair two of the most time-consuming vegetables to prep: English peas and fava beans. However, I do not want to scare you off from making this salad, because it's fabulous! Both English peas and fava beans are in season right now, and I love how fresh and bright this salad turned out with the addition of fresh squeezed lemon juice and fresh mint. Since I'm obsessed with sheep's milk feta at the moment, and had some leftover from the lamb sliders, I added some of that, along with some toasted pine nuts and green onions for texture. Let's start with the English peas, also known as shell peas or garden peas. I actually remember these from childhood when my mom had a garden. I remember helping to shell them (which, thinking back, was a smart move by mom). A pound will only yield about a cup of peas, so plan accordingly. To shell them, just pull the string down the pod and pop them loose. It's not terribly difficult, just time consuming. Rinse them and then boil in about 1/2 inch of simmering water for 3-4 minutes until crisp tender. Plunge into ice cold water to halt the cooking. Now for the favas (also known as broad beans). These little guys really make you work for them. But the results are definitely worth it. Like the peas, they come in a pod. But each bean is also covered with a second shell, so it's twice the work. 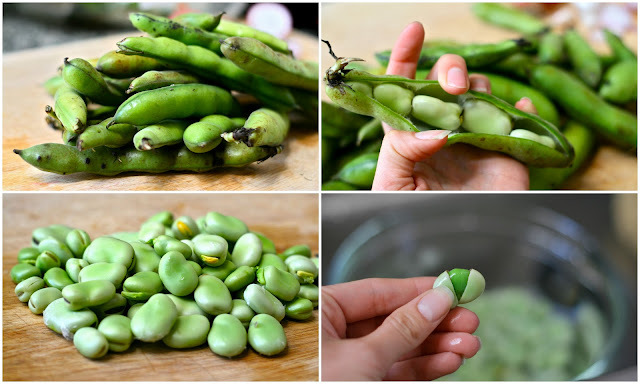 You can use the same technique as the peas by snapping and pulling the string, but I usually just carefully slice open the pod with a paring knife. From there, you can remove the beans, which are a white or light-green color. To remove the skin, you can either steam them or boil them in water for about 3-4 minutes and then put into a bowl of ice water to halt the cooking process. Supposedly, you can pop them out of the shell, but I usually just cut a small slit and get them out that way. (If you are going to be cooking them in a recipe besides a salad, you probably just want to boil them for only 30 seconds before shelling them and then cook them further after they are completely shelled. They are great in a pesto or puree or simply sauteed with leeks and garlic). Once the grunt work is done, it's time to enjoy your salad! Toss the peas and beans with mint, green onion, feta, pine nuts and lemon zest, along with a little olive oil and fresh lemon juice. Season to taste with salt and pepper and enjoy immediately! Rinse shelled peas and then boil in about 1/2 inch of simmering water for 3-4 minutes until crisp tender. Plunge into ice cold water to halt the cooking. Once fava beans are removed from outer pod, boil them in water for about 3-4 minutes and then put into a bowl of ice water to halt the cooking process. Remove bright green beans from white skin. Toss the peas and beans with mint, green onion, feta, pine nuts and lemon zest, along with a little olive oil and fresh lemon juice. Season to taste with salt and pepper and enjoy immediately! I love fava beans! This salad looks delicious, thanks for sharing. You're welcome! :) Thanks for stopping by! wow, so much use of seasonal flavors - well done! i think fava beans are my favorite bean! Does 1 to 2 salads mean 1 to 2 servings?